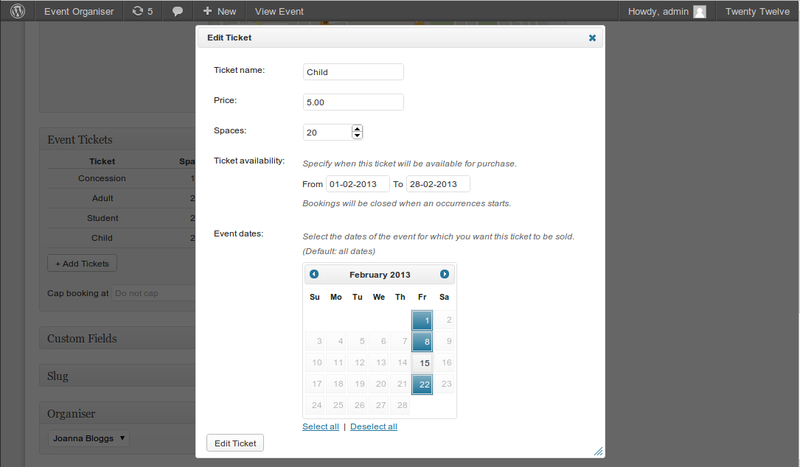 Event Organiser Pro gives you real flexibility for tickets, without sacrificing on an intuitive user interface. entire series (of dates) – such as booking places at a conference, or on a course. If you have selected to sell tickets for the ‘entire series’ then not all the following options will apply, and you’ll be presented with a ‘slimmed down’ ticket option dialog. This allows you to quickly view your event’s tickets, their price, the quantity available and when they the tickets are on sale. (See below). You can also set a cap on the total number of tickets that can be sold for this event. If you are selling tickets for occurrences, this limit will apply to each occurrence individually. Leave this option blank if you do not want to impose a limit. Ticket availability – when the tickets go on sale. You can select a ‘from’ date (tickets are available for purchase after this date) and an ‘until’ date (tickets are withdrawn fro sale after this date). If you do not specify a date, then no limit applies. For example, not specifying a ‘from’ date means your tickets will be immediately available for purchase. This option, for example, allows you to sell cheaper ‘early bird’ tickets. Note bookings cannot be made for past events. Event dates – this only appears when you are booking occurrences. This allows you to limit the ticket to only certain occurrences. For instance you may wish to sell a cheaper ticket for the first few occurrences of your event.